The Contros is a Wi-Fi timer that enables you to set timers and turn your home appliances on/off from iOS/Android phone anytime from anywhere. With easy-to-use features, everyone has the chance to enjoy the smart life! Smaller, but smarter. The Contros is half the size of iPhone 5s which is the smallest smart plug with night light in the world! Designed with a simple interface, you can turn your devices on and off through one-button control. The usually complicated timer tasks are made easy by the user-friendly interface. Mum taps the screen of her smartphone to remotely turn off the light, so that her sleeping baby won’t be woken up. Set the coffee machine to work at 7 am every morning, so that people can enjoy a hot coffee after getting up. The Contros enables you to set the countdown timer to turn off your electric cooker. No more thick porridge and burnt pasta! Based on the timer setup, the router will be automatically turned off, so that people can enjoy a good sleep without being exposed to harmful radiation. Set the repeater time to make the electric watering device periodically water the flowers for you, effectively saving your time and energy. 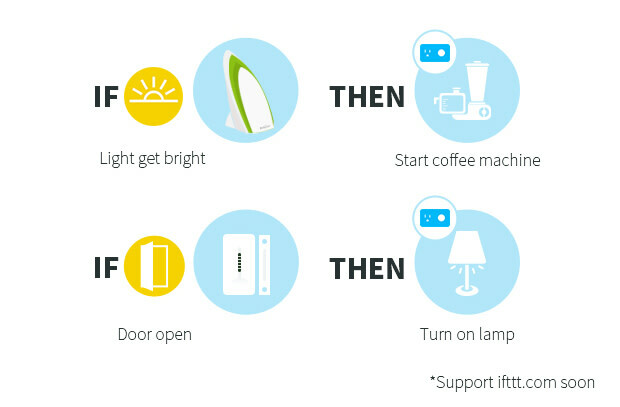 As a protection against would-be thieves, the Contros can turn on your lamp randomly by setting the random timer. Overcharging smartphones will significantly reduce their battery life. The Contros automatically stops charging when the battery is full. Equipped with a mini night light, the Contros can light your way when you go to bed at night. This is also featured in the timer setup function. Are you still wasting time setting up your traditional outlet timer? If so, the Contros is the solution to your problem! With a stable performance, it enables you to automate and control your home appliances. More importantly, the price is even cheaper than the traditional outlet timer. • Stable performanceï¼šThe prior versions of the SP series reached over 500,000 homes which accumulated a huge customer base. As the 4th generation product, the Contros is a reliable product with stable performance. • Secure informationï¼šThe “Lock device” function, effectively prevents your devices from being controlled by other people. • Reliability: Available with US and EU plug types with TUV certification, the Contros is designed with fire resistant PC material and tested with over 50,000 switches life time. •Download the free BroadLink “e-Control” App from the Apple App Store/Google Play. • Plug the Contros into the power outlet, making sure the Wi-Fi LED is flashing rapidly before proceeding to the configuration mode. • Enter the password of your Wi-Fi network on the configuration page, tap“Configure” to connect your devices to the WLAN. • Control your devices from anywhere.